Thank you for joining the live coverage of this match. Please head over to our coverage of the Chennai Super Kings vs Rajasthan Royals match, which we hope will be a more even contest than the one we saw here. Bye! If there was any doubt after the Warner-Bairstow onslaught as to which way this match would go, Nabi's early wickets effectively finished this match within the powerplay overs itself. The very next ball, Chahal skies it and Deepak Hooda only too happy to get under it. Sandeep Sharma bowls the 20th over. Gets Siraj to hit the ball up in the air with his fourth ball. Nabi misses. Chahal and Siraj still holding fort for RCB. 122 runs short of SRH's total. Everything happened in that ball. Both batsmen run out, on both ends. Also a no ball called. So a free hit coming up. De Grandhomme has to go. Out for 37. RCB 109/9. Siraj has joined De Grandhomme. Last two overs before RCB are put out of their misery. Umesh Yadav guilty of ball-watching. One of the batsmen had to sacrifice his wicket. Umesh decides it has to be him. RCB 8 wickets down. Three overs left. 130 to get. CDG and Umesh still there. Can they treat the Hyderabad crowd to some shots? Rashid back on with the ball. Vijay Shankar hit for four by Umesh. Umesh moves on to 13. That might well be the most convincing shot in this innings. Gone to the second tier, that one. Umesh opened the batting for Vidarbha in a T20 match recently. RCB 95/7 after 16 overs. Slower ball from Sandeep Sharma gets the wicket. Ray Barman out for 19. RCB 86/7. Batsmen scoring in ones and twos. Hardly enough to get close to the target. RCB need 146 runs in the last 5 overs. Great ball by Rashid Khan to finish the over. Disappointing day for him with the ball so far though. Hits Rashid Khan for four. Diving effort from Manish Pandey. Stretched out his hand but just failed to reach it. Would have been a sensational catch. De Grandhomme on 31. Ray Barman gets under that ball by Bhuvi and gets enough bat on it to guide it to the fine leg fence. Another four! 12 runs off that Rashid over. RCB 63/6 after 12 overs. First ball of the over sent to the leg side boundary. Only 1 run off that over apart from that six. Grandhomme finally hits a ball out of the park. Kaul the bowler. The last and only six of this innings had been hit by opener Shimron Hetmeyer. Four runs off that over. Grandhomme and Ray Barman happy to not take risks. Maybe the RCB game plan is to not lose too badly and thus protect the NRR. After the Nabi show, his Afghanistan teammate Rashid Khan introduced into the attack in the 10th over. 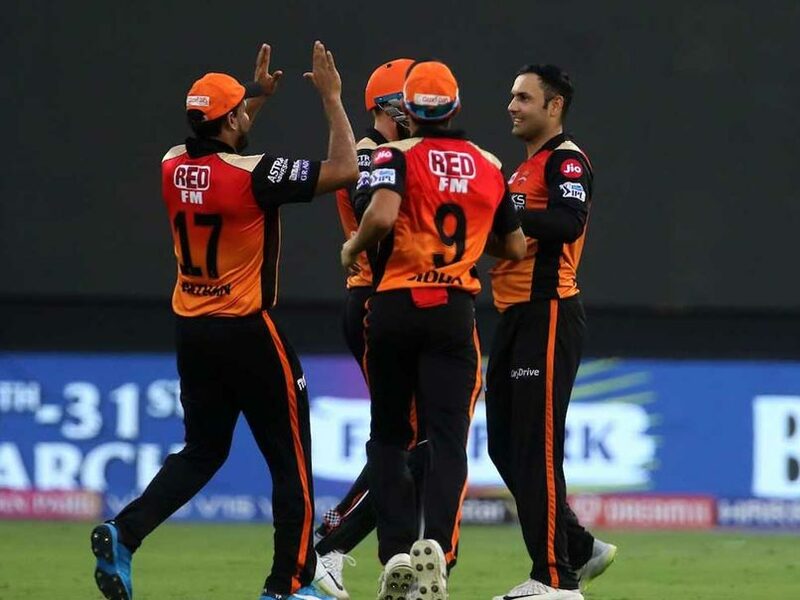 Four runs from that over by Siddharth Kaul. De Grandhomme and Ray Barman are at the crease, not looking too concerned by the required run rate. Just for mathematical reasons, RCB need 192 runs in 66 balls. The collapse in the season opener vs CSK was ascribed to the pitch. 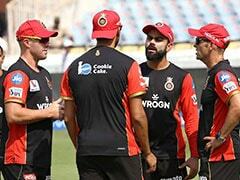 Today's collapse will raise some serious questions about RCB's composition. What a divine spell from the Afghan! 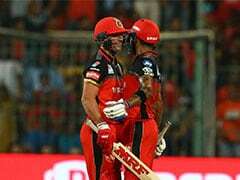 RCB 36/6 after 8 overs. Remember, Rashid Khan is yet to bowl. Dube finds long on like the ball had a homing device. RCB 35/6. Look away if you're rooting for the Bangalore side. Nabi bowling his 4th over. 3/10 so far. Has finished this chase before it even began. Some welcome runs for RCB. Shivam Dube and Colin de Grandhomme in the middle. Must be said, it looks like they can only delay the inevitable here. RCB 35/5 after 6.5 overs. Could be another wicket here. Man of the moment Nabi says he thinks they've got their man. And yes, Moeen Ali is miles out of his crease. The RCB disaster continues. 30/5. Sandeep Sharma gets his man. Kohli gone! Effectively, so are RCB's remaining hopes. A great reflex catch by Warner. RCB 30/4. 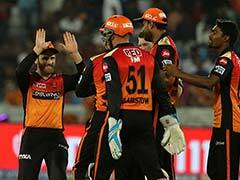 SRH definitely the winner of the powerplay overs. A missed stumping opportunity for SRH there. Could have been Nabi's 4th wicket. Sandeep Sharma lording over Virat Kohli in that over. First four balls of the over produced no runs. Moeen Ali has come in and played two forward defence strokes. RCB are shell-shocked.